Before he played a game for the Cardinals, Ken Boyer was hyped as their best third baseman all-time. In his debut, he heightened expectations, hitting a home run against a Cardinals nemesis. On April 12, 1955, Boyer appeared in his first big-league game, playing third and batting sixth in the Cardinals’ season opener against the Cubs at Chicago’s Wrigley Field. In the eighth inning, with two outs, Red Schoendienst on first and the Cubs ahead, 14-2, Boyer slugged a home run off starter Paul Minner. The longball ignited a productive rookie season and a standout Cardinals career. After hitting .319 with 42 doubles, 21 home runs, 116 RBI and 29 stolen bases for the Cardinals’ minor-league Houston affiliate in 1954, Boyer was assured a spot with the 1955 Cardinals. In December 1954, the Cardinals traded their starting third baseman, Ray Jablonski, to the Reds, making Boyer the heir apparent at that position entering spring training. In spring training, Boyer played well at both third base and shortstop. In a poll of baseball correspondents for The Sporting News, Boyer and Indians pitcher Herb Score were selected the best rookies entering the 1955 season. “He’s deadly efficient and with no apparent weakness,” Cardinals manager Eddie Stanky said of Boyer. Boyer’s performance in his debut game affirmed his skills and his ability to adapt. Minner, a left-hander, often baffled the Cardinals. In a 10-year career with the Dodgers and Cubs, Minner was 21-8 versus St. Louis. He was 48-76 against the rest of the National League. In 1955, when he finished 9-9, Minner was 5-0 against the Cardinals. In his first big-league at-bat in the season opener, Boyer flied out to right. In his next two at-bats, Boyer struck out against Minner, both times with a pair of runners on base. Boyer had a successful rookie year. He hit .264 with 27 doubles, 18 home runs and 22 stolen bases. Boyer was one of four National League players to achieve double figures in home runs and steals in 1955. The others: Willie Mays of the Giants (51 homers, 24 steals), Sandy Amoros of the Dodgers (10 homers, 10 steals) and Boyer’s teammate, Wally Moon (19 homers, 11 steals). Among NL third basemen in 1955, Boyer ranked second in double plays turned (24), third in assists (253) and third in fielding percentage (.952). Yet, Boyer’s teammate, outfielder Bill Virdon, won the 1955 NL Rookie of the Year Award. Virdon hit .281 with 18 doubles and 17 home runs. As predicted, Boyer developed into the all-time best Cardinals third baseman. In 11 years with St. Louis, he hit .293 with 255 home runs and 1,001 RBI. 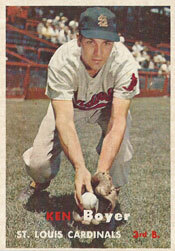 Boyer also won five Gold Glove awards and the 1964 NL Most Valuable Player Award with the Cardinals.